Whether you’re new to San Francisco or have been here many times, I have a few suggestions to make your private tour experience the best possible. Well, more than a few suggestions. Dozens. To begin with, how long you want for a tour is up to you, with a 2-hour minimum. I designed the 2-hour tour to give visitors a great introduction to the highlights and history of San Francisco in a short time. It takes in the Italian neighborhood of North Beach, Chinatown, the mansions of Pacific Heights, the Golden Gate Bridge, Lombard St. and more. And I go all the places a big tour bus can’t! The longer private tours include everything in the 2-hour tour, and adds areas such as the Haight-Ashbury district, Golden Gate Park, the famous Victorians of Postcard Row, and Twin Peaks. 3 hours is very popular, and 4-hours gives you a truly in depth experience of the city showing all the highlights and many hidden gems. You’ll see things even locals miss. And of course, any tour can be customized for what interests you. You want more photo ops? Sure, and with views most tours can’t access. More history? Of course, because I’m an historian and guide, not just a driver. More Victorians and other architecture? Absolutely, and I can even show you a favorite collection of unusual houses even most locals don’t know about. 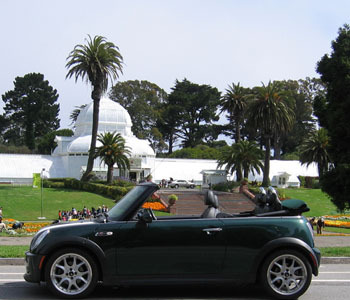 No private convertible MINI tour experience is set in stone. If you have ideas about what to see, I can make it happen. Longer than 4 hours? No problem! Just ask. Of course I go to the Wine Country! I visit a selection of wineries that run from a bit bigger but still charming to a small winery where tastings are held in the presence of three Labrador dogs waiting for belly rubs. What I like best is the convertible MINI Cooper is welcome at the unique, boutique wineries that don’t allow big buses. These are the more interesting, off-the-usual-path wineries most visitors to the Wine Country never get to see. So instead of being elbow-to-elbow with dozens and dozens of other people, your tasting is more personal, and truly memorable. 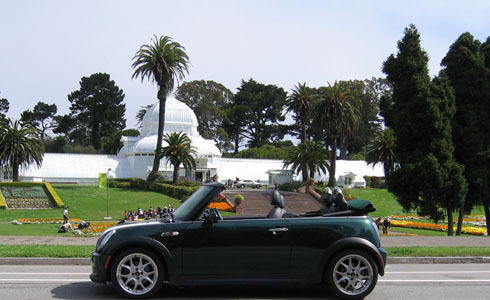 With me and my convertible MINI Cooper, you’ll experience the Wine Country as few visitors do. They’re beautiful, and getting there is half the fun. First we travel over the Golden Gate Bridge, experiencing the bridge as can only be done in a convertible. Then we travel down great scenery to Muir Woods. I drop you off in front, and you spend as much time as you like. You’re not on anyone else schedule but your own. And on the way, or way back, you can see the vistas from the Marin Headlands, and visit Sausalito. The best way to experience a coastal drive without the hassle of being behind the wheel. All tour experiences are $85 per hour. NOT per person. Whether you’re a solo, duo, or trio, it’s $85 per hour for your private tour.